Loving the idea of a chandelier in the kitchen. It just adds a flair of sophistication, glamour and a little something unexpected to a typically utilitarian space. It is a room I never thought to have one in until perusing Eric Cahan's portfolio and now I don't think I will be able to stop thinking about it! Oh, the kitchen is gorgeous, and I like the inclusion of the chandelier as well. isn't it!? 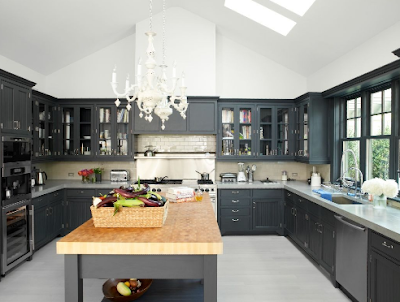 I love all the counter space,the glass cabinents and the gigantic butcher block! I am all for sophistication & glamour! what a great idea, I adore chandeliers and would happily put it anywhere! loving the sleek black cabinets too! Blair--I finally did my post that you tagged me for! That chandelier above the island is really spectacular. I love those dark cabinets too!